Together with Lars SM7WVZ we were active in the Nordic Activity Contest on 28 MHz on Sept 2, 2010. Our QTH, JO65or, was on a Sony-Ericsson parking, which is completely empty in the evening. 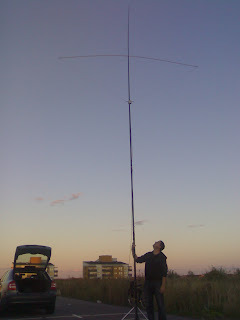 Lars prepared Quad loop for 10 meters mounted on 12m Spiderbeam pole, just to proof the concept. But since we arrived just before beginning of the contest we started with vertical and planned to try Q-loop after NAC.. Unfortunately propagation was not that good at that day and had gone shortly after sundown.